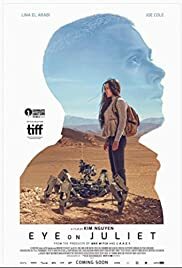 Canadian writer/director Kim Nguyen’s (WAR WITCH and last year’s TWO LOVERS AND A BEAR) new film is a meticulously crafted story of two soul mates in different parts of the world (Detroit and North Africa) that is as strange as it is difficult to believe. The success of a movie often lies not in the credibility of the plot but on how the story, as incredible as it may be is made credible by the medium of film. As such, despite a few far-fetched points, EYE OF JULIET succeeds in not only having the audience believe what is occurring on screen could happen, but also have them root for the protagonists, two misfits in their own cultures but in finding themselves, and meaning in their somewhat meaningless lives. The film ties in the madness of modern technology, in this case a sort of spider form of a drone, with old cultures – in this case the order of an arranged marriage. The film follows, a break-up as it happens in the dark of a dance club. “I love you, I love you,” are the words begged by Gord (Joe Cole) whose girlfriend has dumped him. At work, his supervisor makes him promise that he will go dating again, by connecting with at least 10 people on a dating site. Gord’s job is surveillance. He monitors, using robots (a robotic spider), a pipeline halfway around the world in Northern Africa. One night, Gord notices a young woman, Ayusha, (Lina El Arabi), sitting alone in the dunes waiting to meet her lover. It turns out that Ayusha is planning to go away on a boat with her lover, in order to escape an arranged marriage by her parents to an older man. They need money which the lover is supposed to earn from stealing oil from the pipeline. Gord witnesses the lover’s death through the robotic spider in an accidental explosion. Gord helps her – she is his Juliet – at risk of losing his job. Joe Cole and El Arabi, though amateurs deliver memorable performances. Cole looks like the everyday nobody who is still an individual in his own right. Cole seems to have some raw and redness at the back of his neck, seen throughout the film but somehow clears up at the end of the film. I wonder if this is deliberate, the allergy due to is stress of losing his girlfriend. It is clear that Gord and Ayusha are not lovers. But it is clear that the two are connected by circumstance. Nguyen’s film is slow moving, but surprisingly very engaging. Nguyen has the talent of being able to keep his audience glued to the screen by means of details in the plot, one example being of Gord blackmailing his supervisor or and another by observing his supervisor’s sleeping habits. There are two points in the film that stretches credibility. One is the robot blasting one a window of a house, thew window just popping open after the blast. The other is the ending where Gord and Ayusha agree to meet a t a fixed time and place in Paris. EYE ON JULIET is meticulous filmmaking and it shows.